Shearing day went great this year! It was a beautiful sunny day in the 60s, we had visitors who watched, great helpers (Barb Page, Stephanie Ellis-Wise, and Byrd Wilkins) and the best professional shearer, Sam Murphy from NZ. 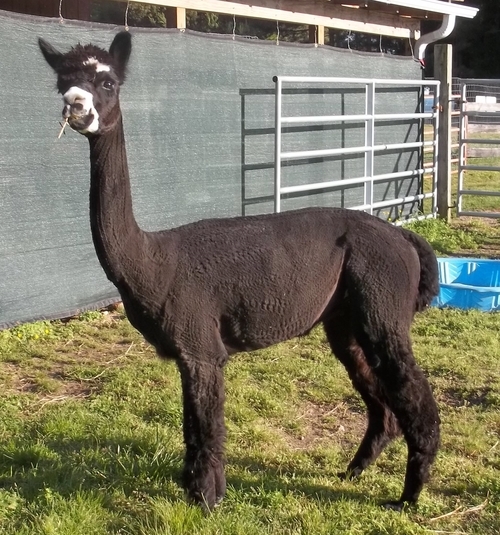 Here's what happens when each animal is sheared: Sam and his helper shear each animal and, when needed, clip toenails, grind the bottom front teeth to even out them out so they can graze better, and clip fighting teeth. 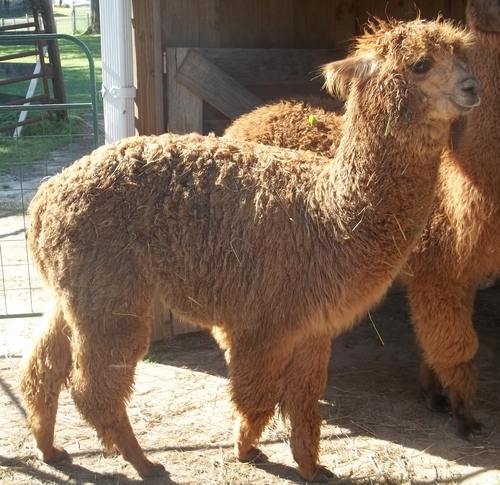 One of the wonderful things about alpacas and llamas is that every bit of fiber can be put to use. Sam first shears off the best fiber (the blanket area) and that is bagged in a separate bag. The same is done for the 2nds and 3rds so the shearing of each animal results in 3 bags of fiber with a sign in each identifying the animal by name, grade of fiber (1st, 2nd or 3rd) and the shearing date. Barb and Stephanie had to move fast to have the bags ready and fill them with the appropriate grade of fiber as Mike quickly pulled the freshly trimmed fiber away from the animal. Byrd kept track of what was done with each animal so we would know how to calculate our payment and so I would have the information to add to each animal's record. This is probably the least favorite day for our animals but it contributes the most to their health. Sam and his helper get each animal done in about 5 minutes so they don't have to be stressed very long. None of them like being tied down but some lie quietly while others vocalize and spit their way through the 5 minutes! But....after shearing is over....when you look outside you see sunbathing animals in all the pastures! They have rolled in the dust and are lying on their sides soaking up the sun, which they have not felt for quite a few months! 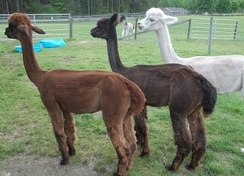 We had 15 alpacas and 3 llamas sheared in 2.5 hours. If we had room for 2 shearing stations that time would have been cut in half. 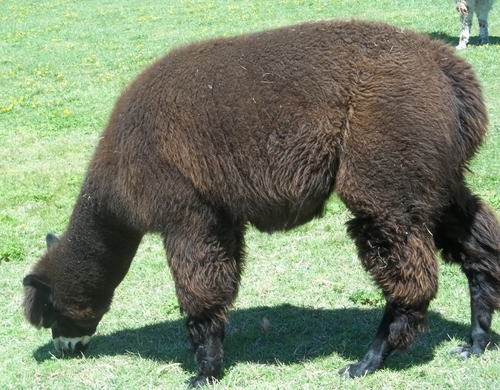 All in all, we had animals sheared that ranged from our 5 week old Ollie to our gentle giant Geronimo (our 425 lb guard llama). This is the 3rd year we have had Sam shear and we will continue to hire him as long as he comes to the US during shearing season! A big thanks to Heidi Kittrell of Celestine Ridge Alpacas for organizing the shearing schedule for the southeastern states! 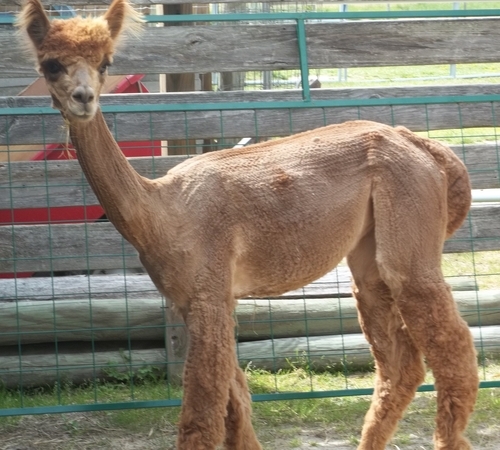 Here are a few before and after pictures from shearing day but be sure to see our photo album labeled Shearing Day 2015 that has alot more pictures.